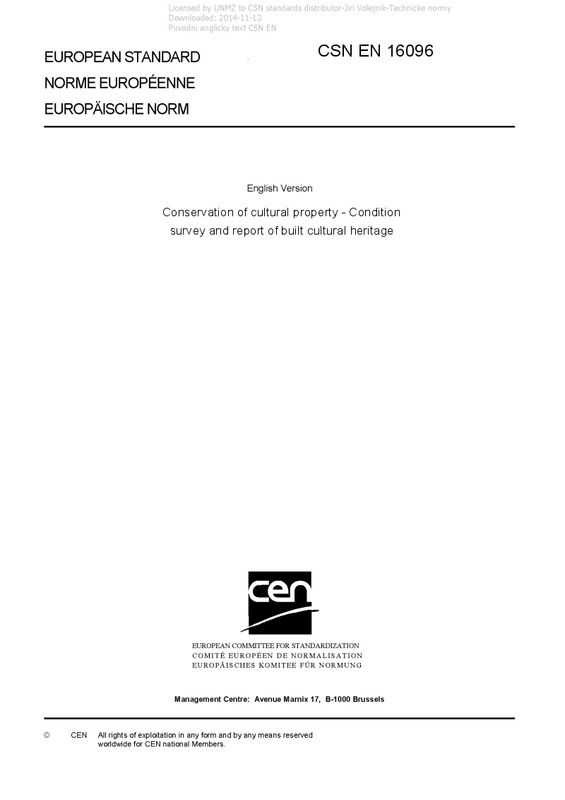 EN 16096 Conservation of cultural property - Condition survey and report of built cultural heritage - This European Standard provides guidelines for a condition survey of built cultural heritage. It states how the condition of the built cultural heritage should be assessed, documented, recorded and reported on. It encompasses evaluation of the condition of a building or other structure mainly by visual observation, together – when necessary – with simple measurements. The relevant data and documentation on the built cultural heritage should be collected and included in the report. This European Standard can be applied to all built cultural heritage such as buildings, ruins, bridges and other standing structures. Built cultural heritage comprises both protected and non-protected significant buildings and structures. Archaeological sites and cultural landscapes are not dealt with in this standard. This European Standard does not specify how to carry out a diagnosis (3.7) of the built cultural heritage. For listed/protected immovable heritage, specific national rules for expert documentation and works may apply. This European Standard may be applied in order to: a) identify maintenance measures and the need for further investigation and diagnostics of damage; b) define procurement needs and the requirement for detailed specification; c) provide a unified method to obtain comparative data, when carrying out a condition survey for a group of buildings or a region.